Steve Carter, incoming pastor at Willow Creek. Willow Creek was Saddleback Church before Saddleback. For more than 30 years, Willow Creek Community Church in the Chicago area has been the flagship of the Church Growth Movement. By watering down doctrine and adopting (in some ways, inventing) the “seeker-sensitive” approach to ministry, Willow Creek herded goats into their doors, fed them sugar blocks, and slapped the word “church” on it. In 2015, the church announced that after a year of research into its membership, it recognized that their seeker-friendly approach was a near-total failure at creating serious disciples and pledged to change their ways and focus more on teaching the Bible (novel approach, we know). Since then, Willow Creek has changed leadership and seems to be struggling to change from their doctrineless, watered-down, evanjellyfish ways. Its new upcoming lead pastor, Steve Carter, recently joined the Bishop of Rome for warm fellowship and ostensible partnership. According to this Protestant (lol) evangelical pastor, the Bishop of Rome (aka the Holy Father, Vicar of Christ and Head of the Church – three names reserved for God the Father, the Holy Spirit, and Jesus Christ) is the type of listener, pastor and encourager that he wants to be. Maybe Willow Creek’s new pastor hasn’t heard of the Protestant Reformation. Maybe he didn’t know that the Pope is the type and shadow of the antichrist who has raised himself up to be God. Maybe he hasn’t heard about things like the Council of Trent or Vatican I or Vatican II. Maybe he’s unaware of the Pope’s doctrines of papal infallibility, the immaculate conception and bodily assumption of Mary, purgatory, or denying Sola Fide. Maybe Steve Carter doesn’t know what he’s supposed to be doing or teaching. Maybe he’s just vaguely unfamiliar with Christian doctrine in general. It’s either that, or Carter himself is a wolf in sheep’s clothing who’s as wicked as the Pope himself. Some social media followers questioned Carter about becoming an odd bed fellow with the Scarlet Harlot. His response in unsurprising, yet nauseating. Firstly, writing as a Protestant here, heck yes the photo triggers us. Are you new to Protestantism, Steve. Why wouldn’t it trigger us, especially when it is laced with a compliment? Secondly, what’s the thought here, Steve? Do you think you’re going to spend some time making selfies with the Antichrist and then become his text-buddy? Are you two going to exchange pen-pal letters now and you hope to sneak a rebuke for idolatry in there somewhere? 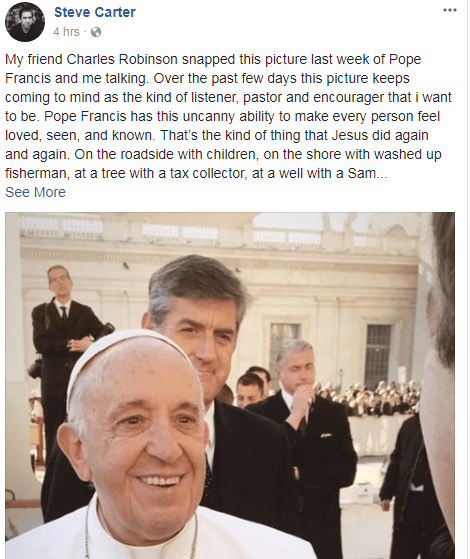 Will there be tin cans with string tied betwixt them strung up somewhere between Chicago and Vatican City so that you and the Pope can have some long, heart-felt late-night talks? Is the presumption that the Pope just hasn’t heard of Christianity yet, and by his relationship with Steve he’ll come to Jesus? I mean, he’s the Pope. He’s heard of the Gospel. It’s anathematized in his church councils and he stands against all that is good and pure. If you only had a few seconds with the Pope, what would you say? Here’s how Ian Paisley handled that opportunity. 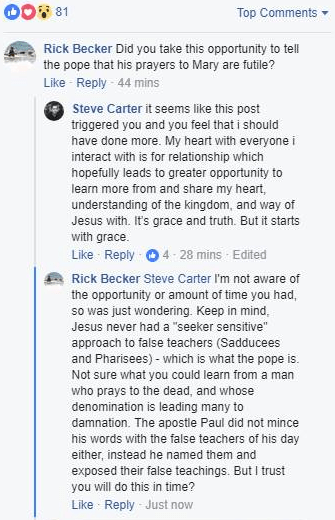 Thirdly and most importantly, Steve Carter equates “grace” with “not telling someone they’re in sin.” This is a perverse understanding of grace for a pastor. As John Newton wrote, “Twas grace that taught my heart to fear…” To call someone to repentance is an act of God’s grace toward that individual. To meet with the Pope and not frantically tell him that he is Satan’s gimp is not gracious, it is treason against God and hatred toward whatever fleshly body currently sits in the Antichrist’s seat. Grace calls to repentance; not calling to repentance is hate. One can expect the tenure of Steve Carter at Willow Creek to be graceless, because its pastor has tragically confused niceness with grace.